I hear what you are saying: I don’t eat fast food or drink sodas? It doesn’t really matter, simply because eating mostly cooked, animal products and processed food is equally atrocious behaviour, that not only can make you extremely sick, but it pollutes our planet to such an extent that it’s becoming all too apparent. It goes to show how the values of our society are inverted. A good friend of mine once said to me “I’ve just been to the doctor and he told me I was OK!” I was thinking to myself: What does the doctor know? In Natural Health, doctors are called allopath for a reason: they are trained to treat diseases, not to prevent them. You may show no symptoms today, but there’s nothing doctors can do to prevent you from becoming sick tomorrow unless they help treat the “cause” of disease, but that is not what medicine does. And not only that, the majority of the public is still so ignorant and brainwashed about what human health sciences mean that they think of natural health disciplines as “pseudo” sciences. Yes, you hear it right, they consider any science that teaches you how to eat healthy and prevent disease as “quackery”. Well, it goes to show how badly indoctrinated towards business and profits our societies really are, to the extent that it massively affects your health. After all, it makes perfect sense to call anything that promote healthy eating and prevent disease for those who expect you to get sick and then sell you drugs, ‘quackery’ right? Healthy people don’t make money for the pharmaceutical industry, only sick people do. Do I think that following a raw plant-based diet, or as society calls it, “an extreme diet” is good for you? Well, think about it. An “extreme” diet of fruit and vegetables will give you those “extreme” great results you are looking for, period! Is it worth it? Well… Unless you enjoy spending time in hospital beds, the answer is categorically, YES! And the biggest secret of all – Ironically, you will not miss the taste of junk food after your taste buds adapt and change to eating healthy raw food. It’s as simple as that. Is it easy to change habits? No, it’s is not, and it can take time for some people; but if you do transition to raw foods correctly, you’ll achieve heaven on earth. I had a laugh the other day on a Facebook group when someone had been accused me of teaching “pseudo-science”. And I said to them, listen mate, if you think that promoting a raw food diet and fasting is pseudo-science; then all I can say to you is good luck, because you’ll need it. Thank you dear Ariel for yet another GREAT article! I enjoy reading your writings, so many thanks for all of your work and great way of thinking! Another great article! Thank you! Please keep writing and promoting healthy lifestyle as people and our beautiful planet is in need! I’d rather not use the word “extreme”. 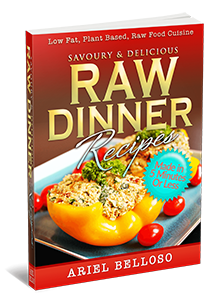 The diet proposed by the raw eaters is like reverting to the pre-cooking days. Man used to feed like this for years before. Before I read your article I imagined what I would have written for an article. And I also would have made out that the cooked food diets that people eat as extreme and absurd. I call what most people eat the Standard American Death Diet. And yes it is 100% extreme to put into your body anything and everything without considering if it’s even really food or edible by humans and health giving.